MORPHO SAILS – transforming to the wind! MORPHO SAILS – The world’s first “One Range” sail brand. All the power for real world windsurfing. Developed by Mark Thoms in cooperation with Tenerife’s José Fernandez. 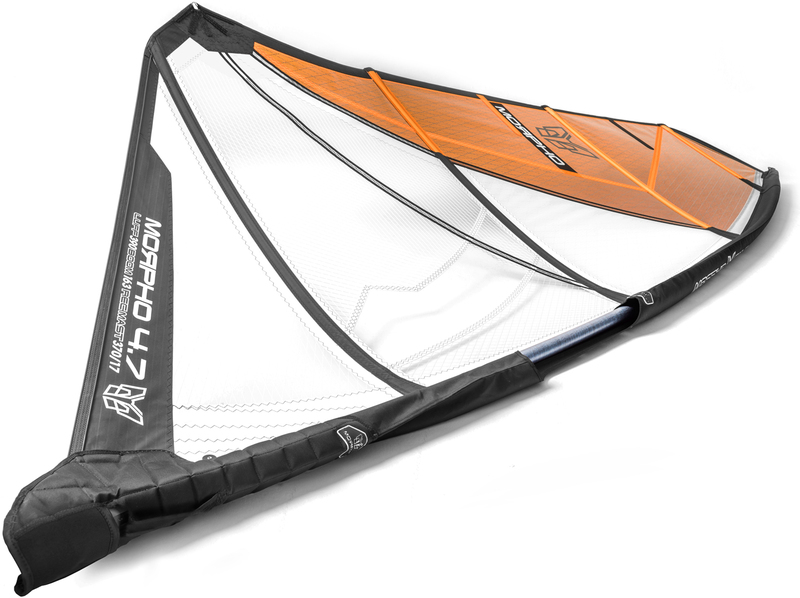 MORPHO SAILS introduces an ultra-compact range, morphing from wave (3.4 – 5.0) to freewave (5.3 – 5.7) to freemove (6.3 – 6.9) into freeride (7.6 – 8.4). No double sizes. Just powerful sails with an exceptional wide range. That means less sails to a quiver. It gets even better: MORPHO SAILS work on any modern mast, on any curve! In fact, the performance and power morphs with the mast’s bend characteristics: A Soft Top (curve 13-15) mast will get you going noticeably quicker in light wind, but obviously, will be harder to handle in high winds. Switching to a Hard Top (curve 7-9) will get you more high wind handling and control but less low end power. This in mind, we recommend a Constant Curve to deliver the most balanced performance profile – like our Curve 12 MORPHO masts in either 90% or 60% carbon. Despite expensive features like Symmetric Batten Wrap, 2CarbonStringers or a super robust PVC Window, our factory-direct business model allows us to offer full DimensionPolyant® Scrim/X-ply sails at very affordable prices. MORPHO SAILS: POWERFUL. LIGHT & DURABLE. QUALITY YOU CAN TRUST!